Al Jazeera English journalists Baher Mohamed, Mohamed Fahmy and Peter Greste were arrested in 2013 in Egypt. Greste and Fahmy received seven-year jail terms, while Mohamed was sentenced to 10 years, after they were accused and convicted of aiding terrorism and spreading false news, in a case that sparked international outrage. Public calls of support for the release of the journalists have occurred throughout the social media campaign #FreeAJStaff, with more than 137,000 people sharing their support on Twitter, reaching 112 million people and delivering more than two billion impressions. This is just one instance of attack on press freedom and on journalists. There is atleast one journalist killed every week in some corner of the world while bringing news to us. The United Nations General Assembly (UNGA) adopted the Resolution on Safety of Journalists and the Issue of Impunity at its 68th Session on 18 December 2013.The Resolution also proclaimed 2 November as the International Day to End Impunity for Crimes against Journalists. To read more about this, please click here. 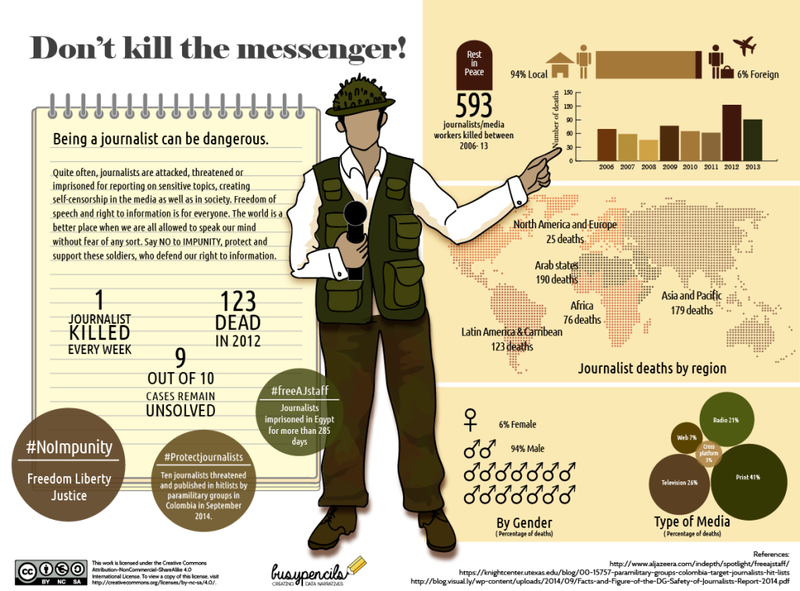 BusyPencils created an infographic highlighting the data that UNESCO has compiled on the killings of media workers worldwide from 2006-2013. Our goal was to create original visual material that will heighten global awareness of the issue of impunity, and its devastating effect on journalist safety and freedom of expression. The graphic aims to focus on moving forward, using the data on the current state of things as a point of reference, not simply reporting on what exists or being critical. Since the main goal is awareness, we have tried to create something that people are eager to share with their social circles. The aesthetic challenge was to make this grim topic shareable, while still communicating the seriousness of the issue.